Think about what happens when Mum or Dad tells you that dinner is ready – you can hear them asking you to wash your hands, feel the water and soap against your skin, smell what’s cooking, see your chair at the table and taste the food on your plate. You can do all of that thanks to your senses! Senses allow us to observe and understand the world around us. There are five main ways we can do this: through sight (with our eyes), touch (with our fingers), smell (with our nose), taste (with our tongue) and hearing (with our ears). 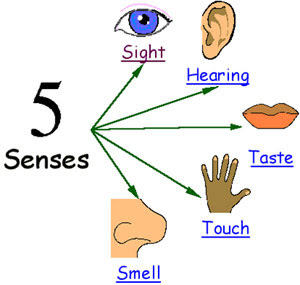 There are five senses – sight, smell, touch, taste and hearing. Our senses help us to understand what’s happening around us. Our senses send messages through receptor cells to our brain, using our nervous system to deliver that message. There are four kinds of taste receptors on the tongue – bitter, sweet, salt and sour. Some parts of the skin are more sensitive than others – this is because they have more receptor cells. We taste food using both our sense of taste and smell. It’s fun to experiment with your senses – for example, make a chart of what foods taste bitter, sweet, salty and sour. If you cup your hand around your ear, you’ll hear more things – this is because you’re helping your ear gather more sounds. Not everyone is able to use all five of their senses. If someone cannot see, they are blind; if someone cannot hear, they are deaf. We can use all five of our senses at the same time without even realising it! Our tongue can have 2,000-8,000 taste buds on it! We need our sense of smell in order for our sense of taste to work properly – if you hold your nose shut while you eat, the taste won’t be as strong. It’s why food sometimes tastes plain when we have a cold and our nose is blocked up. Most of our ear is in our head – not the bit we can see! The part of our ear that we can see helps gather sound waves into our middle and inner ear. If you cup your hard around your ear, you can hear more – why not give it a try? Our ears have around 24,000 sensory cells. The smallest bone in our bodies is in our ears – it’s called the stirrup. …your fingerprints – nobody else has fingerprints like yours! The skin is the largest organ we have – it covers our whole body! If someone is not able to see, they are known as blind. They can learn a special way to read books by touching pages to read words made from little bumps in the page – this is called Braille. If someone is not able to hear, they are known as deaf. Sign language is a way of talking by using your hands, and this way deaf people can understand what you’re saying. Can you spot these images in the gallery below? The taste receptors on our tongue are organised with bitter at the very back, sour and salt in the middle, and sweet at the tip. Our eyes use two kinds of receptor cells – cones, which help us see colour, and rods, which enable us to see at night by telling our brain what’s black and white. Ears have three parts – outer, which is the bit we can see and helps to guide sounds into your ear, middle, where the sounds around us vibrate, and the inner, which receives these vibrations and turns them into signals that get sent to our brain. Have you ever noticed that sometimes you smell something very strongly (like fish at the fishmonger’s counter when you go food shopping with your mum), then after a few minutes the smell starts to go away? That’s because our nose has stopped sending signals to our brain, so our brain thinks that the smell isn’t really there anymore. More than 75% of the taste of food that you’re eating comes from your sense of smell, not your sense of taste. There are around 20 million neurons all the way up inside our nose in the area that detects smell. Some parts of our skin are more sensitive than others, like our palms and fingertips, for instance. We can feel things more strongly there than we can on our back. Use your sense of hearing to work out which sound goes with which picture. Take a free online hearing test. Choose the correct item based on what it tastes, feels, smells, sounds or looks like. 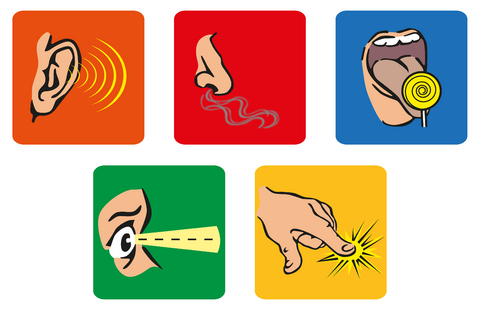 Try some senses experiments at home. Use an interactive sound ruler. Try some experiments to find your blind spot. Trick your brain with some optical brainteasers! Turn your nose into a super-nose. Create your own tongue map. Find out more about your blind spot with an interactive game, Eye eye! Find out how toothpaste can affect your taste buds. Use a noise meter to listen to sounds. Train your nose to work better! Complete a quiz about ears. Find out about supertasters and why they experience taste more intensely than other people. Could you be a supertaster? Try these fun experiments for the five senses. How your brain understands what your ears hear – watch an animated video to find out. Find out more about how vision problems can be corrected. Learn all about animal senses. Use sound to understand the position of objects with an experiment. Look through the Dangerous Decibels online exhibit to find out more about the dangers of loud sounds. Try this interactive guide to the human eye to see how we see.